The future of TV, according to Apple: has the tech giant finally cracked it? Max Slater-Robins reports in on why Apple believe "apps are the future of television"
Steve Jobs' vision for the future of TV, relayed to his biographer Walter Isaacson soon before his untimely death in 2011, is slowly being realised by Apple. Some have, over the years, argued that Jobs did not “finally crack it,” as Apple's negotiations to bring a 'full' TV set—i.e. one that plays terrestrial channels, like ESPN, and exists on its own—have broken down. As such, the latest version of the device is good but does not resemble a traditional TV experience. However, the company has made something else entirely and, according to CEO Tim Cook, it could be the future of TV—and the company's plan all along. The idea of apps is, according to Apple, a central part of the Apple TV, which costs £129 ($149) for the baseline model with 16GB of storage and a new remote that can be used to navigate apps and play games. “It all starts by recognising that apps are the future of television,” says Apple. “BBCiPlayer, Netflix, NOW TV — apps are quickly becoming how we watch today.” It's this idea—that apps are the future—that means Apple, arguably, does not need to work on partnerships, it just needs to open up its TV to developers. And that's exactly what it has done. “Apple has totally revolutionised the business,” said Luke Whittaker, co-founder of State of Play, a studio that makes video games. His app, 'Lumino City,' has been designed to use tvOS, the operating system that runs on the TV. The gameplay of 'Lumino City' involves moving a character from point-to-point and the company has worked with artists, architects, and designers to create a stunning visual experience. This is why Whittaker is excited about the Apple TV and has brought its apps to it: Beautiful, iPhone-like apps are possible on a TV. Touchpress, a London-based company that makes premium apps, has also invested heavily in the TV, buying into Apple's vision that “we gather together around our big screens to watch big shows and big events.” One app, which the company demoed at an event held by Apple, focuses on orchestral music, presenting it in new and exciting ways. The music is presented visually, with different ways to “watch” an orchestra perform a piece. One mode, called “Beat Map,” shows which instruments are playing in real-time. A mode that just shows the orchestral score is also an option. Alex Johnston, the chief marketing officer for Touchpress, seemed excited about the Apple TV when I spoke to him as it lets the company express classical music in a new and interesting ways. 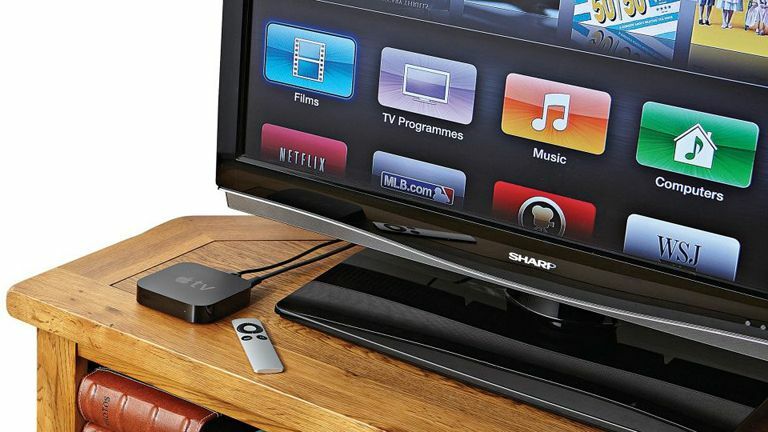 The company has over 100,000 users of its app for the TV, according to Johnson, all of whom use it regularly. Touchpress is one of the most interesting apps for the TV because the company had developed an app that wasn't a game or an extension of its iPhone counterpart but something genuinely cool and useful. This, it would seem, is the goal for the Apple TV and could explain why the company is betting so heavily on apps. It's important to the remember that third-party apps, the little programmes that run on an iPhone or iPad that are downloaded from the App Store, were not part of the original iPhone, just as they were not part of the original Apple TV. In 2008, Apple rolled out an SDK for the iPhone, which let developers code for it, opening the gate to an industry that didn't exist before at the same scale. The industry is now, according to Apple's most recent set of regulatory filings, worth $31 billion to Apple and its hoard of developers, many of whom solely make apps for the iPhone. It's clear that the company is looking for ways to continue to make the ecosystem exciting beyond the iPhone, and the job has fallen to another big screen in people's lives. One company that has bought into the excitement of the Apple TV is Just Eat, one of the leading ways to order food from a myriad of vendors on a mobile device. Just Eat, a London-based company, floated on the stock market in 2014 and has revenues of around £150 million per year, according to regulatory filings. As such, it is not a small-time business and the investments it has made in the TV are important. This recurring theme—the iPhone syncing with the Apple TV—is something Jobs envisioned and, according to the developer demos I have seen, it is a strategy that works. Another app, 'Not On The High Street,' lets users scroll through many high-end products, such as jewellery, before making the purchase on the sister iPhone app. The company is using Bonjour, a technology Apple includes in all its products, so that the two can communicate, according to Rob Stearn, a software engineer for the app. Letting apps communicate between one another is important as it builds off from the ubiquity of the iPhone. This is also a strategy Apple has pursued with the Watch. Both products are included in the “Other” category of devices on Apple's earnings reports, a segment that grew revenue from $2.7 billion in the holiday quarter of 2015 to $4.35 billion in the three months leading up to January. For the 'Future is Apps' idea to work out, Apple needs developers big and small to be on-board with its project. There are over 3,000 apps in the Store currently, with more on the way. The strategy does face some problems, however, including the usefulness of apps without the ability to watch actual TV. Apple has been “frustrated” by the negotiations with cable companies, according to the president of ESPN. The TV is currently an accessory, not a full-on solution for TV like some of Samsung's “smart” TVs that also use apps are. Getting past this barrier will be a challenge for Apple, but the interest from developers at this time is certainly a good sign.